Indian Army Bharti Kolkata 2018: Open Recruitment Rally Dates Announced! Indian Army Bharti Kolkata 2018: Open Recruitment Rally Dates Announced! : Here’s a golden opportunity for volunteers who want to serve the nation by joining Indian Armed Forces. 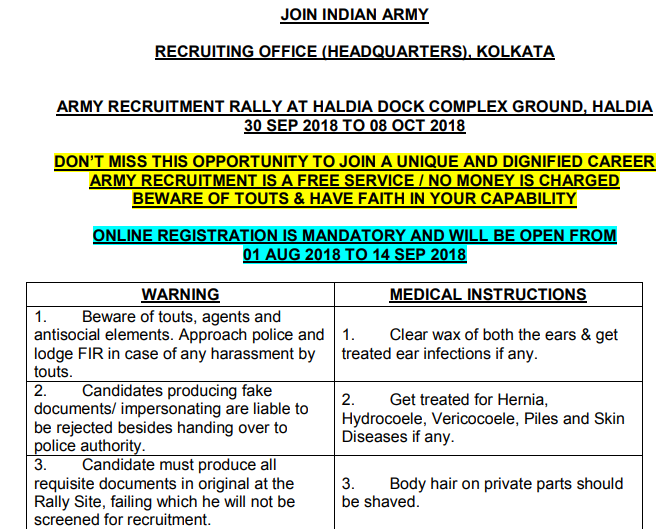 Recruiting Office (Headquarters), Kolkata through a recent official notification on official website www.joinindianarmy.nic.in has conveyed about this. Neither in Rally Site nor at the time of CEE [common entrance examination], mobile phones will be permitted in the Bharti days. 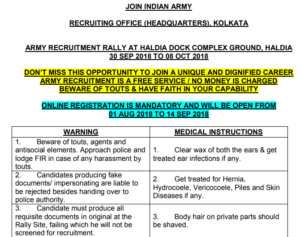 Address that, just fill Online Application Forms from 01st August 2018 to 14th September 2018 and become eligible to participate in Indian Army Recruitment Rally at Haldia Dock Complex Group, Haldia – 30th September 2018 to 08th October 2018. Admit Cards, that is supposed to release soon on the above mentioned official website will contain Date and Time of reporting for each candidate (different in case). Only unmarried male candidates can apply for this post. For applicants facing any issues while registering themselves online, aspirants can contact on telephone no. 033 – 22235253. For PFT Qualified candidates, Board of Controller of examinations, Indian Army will organise CEE (Common Entrance Examination) which will have negative marking applicable. No by post or offline letter will be sent to the registered address of the candidate about an announcement of the result of written examination. Whatever scenario maybe, Indian Army Joining volunteers should not forget to carry the required documents which includes – Single Bank Account, PAN Card and Aadhar Card, Affidavit (available in official notification as well), NCC Certificate, Relationship Certificate, Unmarried Certificate, Character Certificate, School Character Certificate, Religion Certificate, Caste Certificate for Scheduled Tribe, Domicile/ Permanent Residential Certificate in case of non-Bengali candidates, Domicile/ Permanent Residential Certificate (for Bengali candidates), Education Certificate, Photograph and Admit Card etc. Remember 9 Feet Ditch and Zig-zag Balance are just for qualifying and no marks will be awarded in both of these cases. Whereas, specific marking scheme is there in case of Pull-Ups and Running. Like 60 Marks and 40 marks respectively will be awarded to Group I (upto 5 min 30 sec) and Group II (5 min 31 sec to 5 min 45 sec) Qualifiers. Physical Fitness Test (PFT) has to be qualified for the following categories – Soldier Clerk/ Store Keeper Technical/ Inventory Management, Soldier Nursing Assistant/ Nursing Assistant Veterinary, Soldier Technical (Aviation and Ammunition Examiner), Soldier Technical. Remain in touch with ALLINDIAROUNDUP for more updates.